With all of the information available about health and nutrition, it is hard to keep the rules straight. Let us help you with that! Corporate wellness programs are our specialty at Summerfield Custom Wellness. Weight loss, diabetes management, and more! Using a HIPAA-compliant video chat program, we can offer our patients nutrition counseling packages without traveling to the office. A nutrition counseling practice of Registered Dietitians and Nutritionists specializing in corporate wellness programs, customized individual counseling, and online education programs. Thanks for stopping by Summerfield Custom Wellness! We are a practice of Registered Dietitians and Licensed Nutritionists in Raleigh, Durham, and Wilmington, NC. With all of the information available about health and nutrition, it is hard to keep the rules straight. Let our dietitians and nutritionists help you with that! Feel free to browse around the website, see what services are available, or contact us with any questions. We look forward to working with you and wish you health and happiness today and always. • We will listen to you, understand your individual needs, and respect your personal goals. • We will help you make realistic choices for yourself that are sustainable over the long term. • We will help you heal deep issues with food so you can float through life making healthy choices. • We will not just tell you ‘what’ to do but explain to you ‘why’ it aligns with the goals you set for yourself. • We will consider your budget and lifestyle when creating a customized plan for you. • We will help you build a specific plan according to the needs of your body and mind. • We will seek to understand what you are going through and are prepared to lead you to better health. • We understand that change is hard. Long term change is even harder. We have to live in the world everyday, trying to be healthy, hoping for the path of least resistance. Let us meet you where you are. 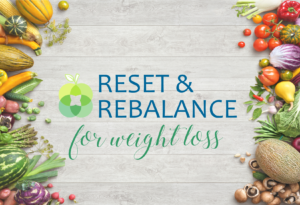 Reset & Rebalance for Weight Loss is an 8 week program based on the science of the glycemic index. The content is available online or delivered in person by one of our Registered Dietitians. Optional nutrition counseling packages are available to provide you with extra support. You can meet with a dietitian at our offices or via HIPAA-compliant telehealth. Find out why our patients love working with us! Call us at (910) 663-5166 and let's craft a plan together!